Why α-humulene? Well, despite the fact that this natural product is a monocyclic sesquiterpene – containing the ever impossible to draw 11 membered ring (horror, I know) - it’s from a class of compounds our customers have had a lot of interest in lately! You may recognize it from the characteristic taste of your favourite hoppy beer, or from the distinctive cannabis aroma. The 60 MHz 1D 1H spectrum and structure are shown in figure 1. You can see there is some overlapping of signals, which make structural assignment quite difficult. 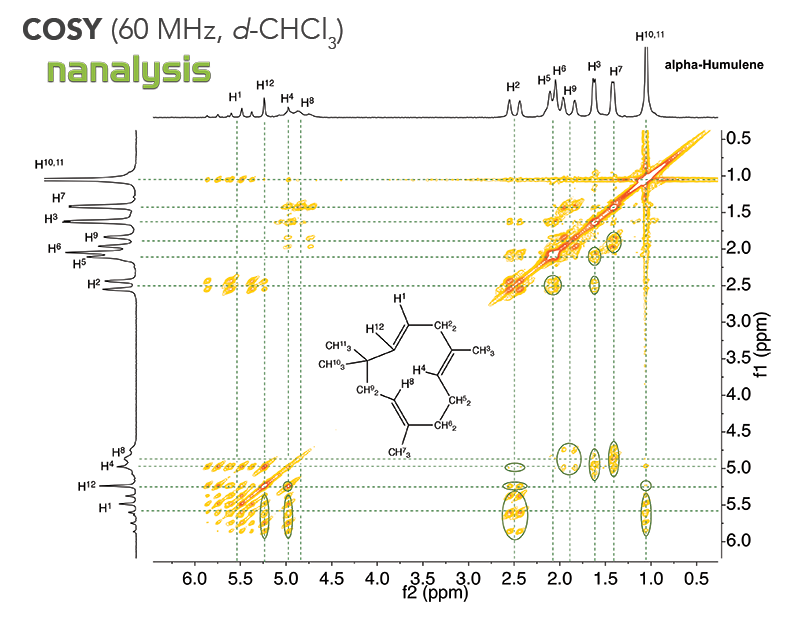 Using the COSY spectra, however, paired with some chemical intuition, we were able to pretty much assign all the peaks in this relatively complex molecule! Figure 2 shows this beautiful COSY spectrum along with the off-diagonal correlations. While some correlations are a little bit weak - for instance H2–H4 – some are more intense than we would expect, such as H1-H4. In my opinion these protons are a little bit far apart to display such a strong correlation, and don’t really have a good suggestion to explain this behavior at further except to suggest virtual coupling? If you have a better idea please discuss them with us! How does this compare to high-field data? Well, for your reference I have included the COSY spectrum of α-humulene acquired in a 700 MHz instrument in Figure 3. Of course at low-field the peaks are broader and we see more second order effects, but the same information is present! Feel free to contact us if you have any questions or if you want to see whether our instrument will be suitable for your chemistry! Neuenschwander, U.; Czarniecki, B.; Hermans I. J. Org. Chem., 2012, 77, 2865.